Chase Headley’s second stint with the San Diego Padres is over. The Padres designated the 34-year old Headley for assignment on Saturday. The club now has seven days to find a trade partner or release him. Considering his struggles this year, where Headley lands will be anyone’s guess. Headley spent the first six and half years of his big league career in San Diego. The Padres then reacquired him from the Yankees over the winter in a trade that also gave them pitcher Bryan Mitchell. 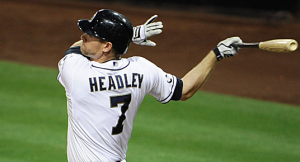 The team was hoping that Headley could give them steady production at third base while also providing a veteran influence for their young team. But things did not work out that way. Headley has played second fiddle to promising rookie Christian Villanueva this season. As a result, he’s started just nine games for the Padres, and during that time, he’s gone 6 for 52 (.115) with one extra-base hit. The Padres never saw Headley as a long-term option at third base. He’s set to be a free agent at season’s end. But they figured he could help them stay competitive during the early part of the season and potentially become a trade chip for them toward the end of July. But with Headley struggling to hit and Villanueva already hitting nine home runs this season, the Padres are better off parting ways with Headley and sticking with their younger players. With Headley being designated for assignment, the Padres used the vacant roster spot to recall utility man Cory Spangenberg. After posting solid offensive numbers last season, Spangenberg has had a rough season in the big leagues in 2018. In limited at-bats, he’s just 11 for 56 (.196) with two home runs. Spangenberg has had no trouble hitting at triple-A this season, so with regular playing time, he should be more productive. With Headley gone, he should get more opportunities at third base in addition to some games at second base. As for Headley, he may not generate much interest considering his age and his struggles early in the year. The Dodgers could potentially use him amidst their injuries, although Justin Turner is slowly working his way back from injury. The Diamondbacks could also have interest with Jake Lamb still on the DL. Otherwise, there are no contending teams with an obvious need at third base. That could give Headley an uphill climb back to the big leagues.